Auburn University is brimming with tradition. Our popular mascot, Aubie, our “War Eagle” battle cry, rolling Toomer’s Corner, the eagle’s flight at football games, and the Auburn Creed are, perhaps, the most widely celebrated traditions at Auburn. But each spring as delicious shades of orange, yellow, purple, red and pink appear throughout campus, one can be reminded of a lesser-known university tradition with roots extending many decades into the past – the tradition of preserving and hybridizing our native azaleas for future generations to enjoy. The native beauties are scattered around campus and represent the tireless dedication of Auburn scientists, faculty and staff. As such, many of the native hybrid azaleas planted at the university are included in the new Auburn Azalea series, which is now available to the public through the College of Sciences and Mathematics Donald E. Davis Arboretum. The series includes spectacular cultivars such as ‘Samford Sorbet,’ ‘Tiger,’ ‘Aubie,’ ‘War Eagle,’ ‘Plainsman’ and more. The native azalea tradition began on an Easter Sunday sometime in the 1940s when the late professor of fisheries R. O’Neal “Smitty” Smitherman was a young boy. He adventured through the woods of Bibb County, Ala., and returned home carrying a mass of sweet-smelling, honeysuckle-like flowers with large pink blossoms. He gave the wildflower bouquet to his mother who taught him the common name of the flowers, “bush honeysuckle.” Each Easter thereafter, Smitherman presented his mother with a similar bouquet. As he grew older, his love for bush honeysuckle strengthened as the appearance of the blossoms sent him reeling back in time to sweet memories of his childhood and mother. Curious by nature, Smitherman eventually investigated the flowers he had come to love. What he learned led to a crusade born of passion for the flowering plant. Smitherman discovered the name “bush honeysuckle” is commonly used to describe more than a dozen species of the deciduous, native azaleas. His fascination with the flowers continued to grow, and for 40 years he documented, identified, collected, grew and hybridized approximately 100,000 plants. Auburn University colleagues joined Smitherman in his work, including the late dean of the College of Agriculture Dennis Rouse, who joined the Auburn faculty as an assistant professor of agronomy and soils in 1949. 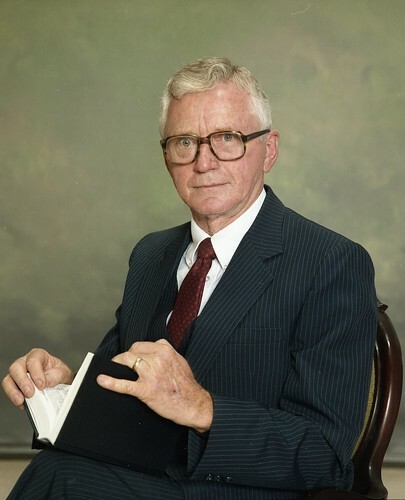 Rouse became director of the soil testing lab in 1956 and dean of Agriculture and director of the Alabama Agricultural Experiment Station in 1972. Rouse was honored for his contributions to Auburn and agriculture in 1993 when the newly erected Life Sciences Building was named for him. Rouse Life Sciences building is maintained by the College of Sciences and Mathematics and houses biological sciences faculty offices, laboratories and classrooms. 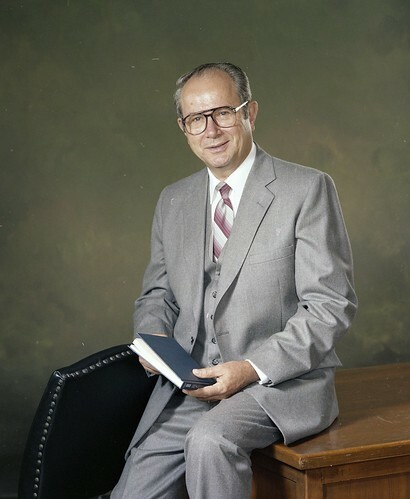 Rouse retired from the university in 1981 and remained active in the Auburn community, focusing his efforts on beautification. While serving as president of the Auburn Beautification Council, Rouse spearheaded a project to landscape the interchange at Interstate 85 and Bent Creek Road. The landscape design included numerous native azaleas, and for his efforts, he received a national award from the Federal Highway Administration. Rouse died in 2003, and sometime following his death the interchange he landscaped was renovated. Many of the native azaleas were removed and donated to Auburn University where they remain at the Davis Arboretum. Rouse also donated native azaleas to many of the university’s landscapes, including Samford Lawn, the President’s House, the Garden of Memory and other locations. Additionally, from 2008-2013, Davis Arboretum Specialist Patrick Thompson lived in Rouse’s former Auburn home. The landscape featured numerous native azaleas that Rouse had hybridized, propagated and planted. In the interest of preservation, Thompson and Rouse’s children transferred approximately 75 native azaleas from the property to the Davis Arboretum. 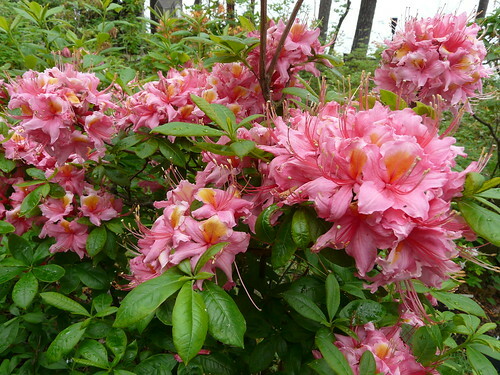 Rouse’s azaleas are some of the parent plants of the hybrids represented in the Auburn Azalea series, and one of the cultivars, ‘Rouse’s Rose,’ was named in his honor by R. O’Neal Smitherman. Smitherman named another of his hybrid azaleas ‘Corley’s Cardinal’ after fellow azalea enthusiast and colleague Tom Corley. Corley received his bachelor of science in 1943 and his master’s in 1949, both in agricultural engineering from Auburn University. He spent his career at the Alabama Agricultural Experiment Station at Auburn, and he is well known for his cotton mechanization research, which played a major role in developing mechanized methods of producing and harvesting cotton. His reputation across the Cotton Belt resulted in rapid acceptance of mechanized methods by all segments of the cotton industry. Additionally, under his guidance, the Alabama Agricultural Experiment Station grew to almost 25,000 acres scattered across 16 locations throughout the state, including the addition of the E.V. Smith Research Center in Shorter, Ala., which remains a flagship agricultural research location in the state. He retired in 1984, and Auburn University named the Biosystems Engineering Building in his honor and in recognition of his 36 years of service to the university and the state. Corley is a WWII veteran and has served as president of the Auburn Kiwanis Club and the Auburn Men’s Camellia Club. In 1964, Corley purchased some land in Loachapoka, Ala., and there were native azaleas growing on the property. A camellia lover, Corley set about filling the property with more than 1,000 camellias that he grew from seed. Each year, as the camellia blooming season ended, Corley began to appreciate the way the naturally occurring native deciduous azaleas provided dimension and additional color in the landscape. As a result, beginning in the 1970s he started collecting native azaleas from the wild and planting them throughout his expansive property. He soon began growing native azaleas from seed, and eventually shared choice selections with fellow native azalea enthusiasts, Rouse and Smitherman. 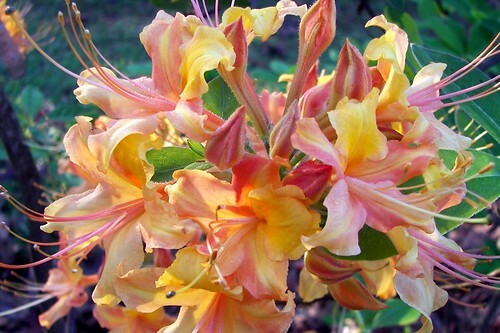 Corley’s native azaleas served as parent plants for many of the hybrids Smitherman created. Smitherman, in turn, not only named one of the hybrids ‘Corley’s Cardinal,’ he also gave Corley some of his young hybrids. Corley would then nurture the young plants in a test garden he installed on his property, where they would remain for three to four years. Once the plants proved to be healthy, blooming specimens, they were incorporated into his 18-acre Loachapoka garden or given away. On his property, Corley has approximately 1,500 deciduous native azaleas, 99 percent of which were grown from seed. Corley has donated countless plants to both the university and city of Auburn, including Kiesel Park, Moore’s Mill Club, Samford Park, the Garden of Memory and the Davis Arboretum. This April, as the azaleas bloom, Corley will celebrate his 95th birthday. 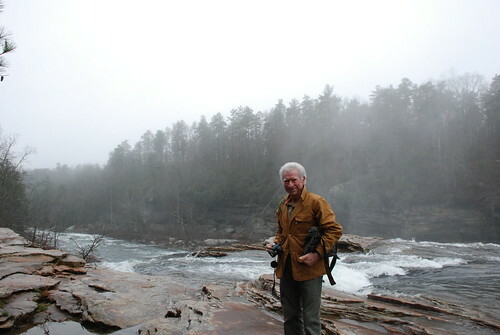 Although he does not propagate plants the way he used to, he continues to welcome local garden clubs, Auburn University students and visitors from all over the country who come to his Loachapoka retreat each spring to witness the breathtaking beauty. 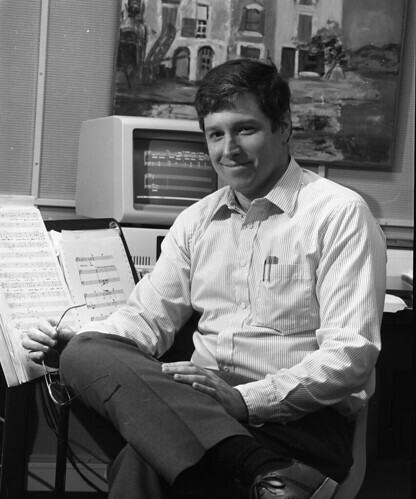 The youngest early contributor to the Auburn Azalea series is Robert Greenleaf, a retired Auburn University professor emeritus of music and composer. He is well known for his full length opera “Under the Arbor,” which premiered in Birmingham, Ala., in 1992 and was distributed nationally to Public Television in 1994. Greenleaf’s orchestral work “Celebration,” was commissioned to celebrate the rebirth of the Alabama Symphony Orchestra and premiered in 1997 by that orchestra in Birmingham. In 1998, “Celebration” was given six performances by the National Symphony Orchestra, and in 2004, “Celebration” was chosen as the theme music for the International Computer Programming Contest, sponsored by IBM, and received its European Premiere by the Prague Metropolitan Symphony Orchestra. Additionally, his song series, “A Modern Woman’s Life and Love” premiered in 2012 at the National Gallery of Art. Born and raised in Auburn, Greenleaf received degrees in clarinet performance from Florida State University and Louisiana State University before returning home to join the faculty at Auburn University in 1974. His enthusiasm for native azaleas is due to the influence of his parents. His mother was a botanist and his father, Walter Greenleaf, was a professor of horticulture at Auburn from 1947 to 1982. Greenleaf eventually made connections with Smitherman, Rouse and Corley who introduced him to hybridizing azaleas. The men shared tips, insights and plants as they grew their hybrids. Some of the hybrids were created from tissue culture or cuttings. Most, however, were developed by cross-pollinating two different plant varieties. The seeds of the cross-pollinated azaleas were then planted and nurtured until seedlings were large enough to pot. The cross-pollination method sounds, on its surface, to be a rather straight forward process; but in reality, the method requires years of trial and error to achieve a single, high-quality plant. The displays of azaleas across Auburn’s campus also include the work and dedication of many others who value the Southeast’s natural heritage, such as Earl Sommerville, a native azalea expert who has been propagating hybrids in Georgia for more than 50 years. It is Sommerville who is propagating the Auburn Azalea series from tissue culture. Other contributors include Eugene Aromi, an art professor at the University of South Alabama who hybridized more than 1,000 native azaleas, some of which are in the Davis Arboretum; Tom Dodd, Jr., an Auburn alumnus whose native hybrid Confederate Azalea is represented in the Davis Arboretum; and the late wildflower expert Caroline Dean. A longtime resident of Opelika, Ala., Dean donated native azaleas to the Davis Arboretum, shared her knowledge by welcoming guests to her expansive Opelika garden each spring, served as president of the Alabama Wildflower Society, and volunteered with the Auburn University Osher Lifelong Learning Institute, which provides academic, not-for-credit programming for adults 50 years and beyond. Dean donated The Caroline Dean Wildflower Collection of photos to the Auburn University Library, which can be viewed online. The collection features images of wildflowers native to the Southeastern United States. In 1993, she received Auburn University’s W. Kelly Mosley Environmental Award for Achievements in Forestry, Wildlife and Related Resources. The award recognizes individuals who have made a significant contribution to the environment through the promotion of wise utilization of Alabama’s natural resources. Her continued advocacy for Alabama’s unique plants and their endangered habitats garnered her national recognition, and in 2008 she received a National Wetlands Award from the Environmental Law Institute for her work in education and outreach. The Caroline Dean Wildflower Trail in Opelika Municipal Park is named in her honor. 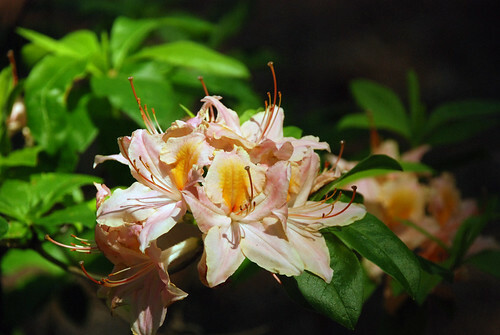 One of the specimens in the Auburn Azalea series, ‘Baker Dean,’ was contributed by Dean and named in honor of her late husband. ‘Baker Dean’ features bright red blooms, is a dwarfish plant reaching a maximum height of approximately 24-inches, and is currently the only specimen in the Auburn Azalea series that was not hybridized in a garden. 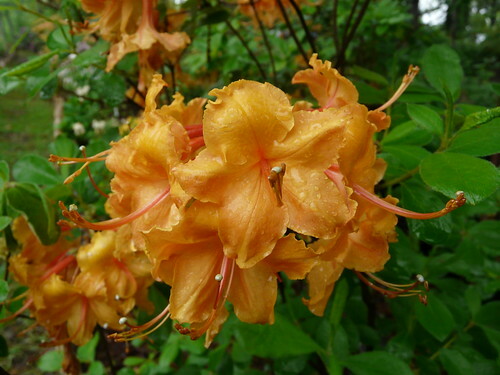 The native azalea was collected in Wedowee, Ala., and propagated by Dean. Dean passed away on Jan. 19, 2016, at the age of 97, leaving behind a lasting legacy of wildflower knowledge and conservation. 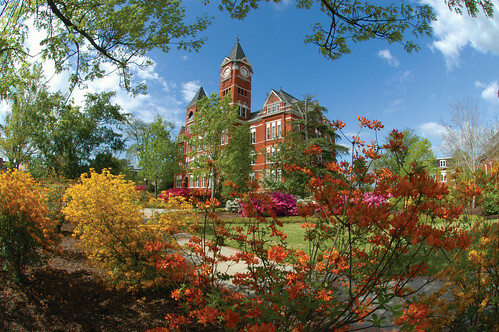 From Samford Hall to the President’s Home, Auburn University possesses hundreds of specimens of native azaleas. The spectacular collection in the Davis Arboretum includes more than 1,000 plants that have been donated, 450 of which came from Smitherman, making the arboretum’s native azalea collection one of the largest and most complete in the U.S.
Arboretum Specialist Patrick Thompson is carrying the torch of Auburn’s native azalea enthusiasts as he works to ensure the plants represented in the Auburn Azalea series continue to be available for generations to come. The Auburn Azaleas are the result of more than three decades of breeding and trials brought to you by Auburn University's Davis Arboretum. Gardeners will enjoy the showy and colorful blooms combined with the hardiness and long bloom season of the Auburn Azaleas. Newly planted native azaleas require regular watering, but once established are resilient and can withstand drought and the intense heat of summer. The plants will grow in partial shade, full shade or full sun; prefer moist, well-drained soil along steams, rivers and lakes; and do best when planted in the fall. To ensure accuracy, each of the plants sold in the Auburn Azalea series are grown from tissue culture. Plants in the series come in a variety of shades of orange, yellow, pink, red and magenta, and include: ‘Aubie,’ ‘Baker Dean,’ ‘Corley’s Cardinal,’ ‘Patsy’s Pink’ (named by Smitherman in honor of his wife, Patsy), ‘Plainsman,’ ‘Rouse’s Rose,’ ‘Samford Sorbet,’ ‘Tiger,’ ‘War Eagle,’ and more coming soon! Specimens from the Auburn Azalea series can be purchased each A-Day at the Davis Arboretum’s spring plant sale, as well as at the fall plant sale or by mail order from October 1 to March 1. All proceeds from the plant sales directly benefit the Davis Arboretum. For more information, visit the Davis Arboretum website at www.auburn.edu/arboretum, and follow the College of Sciences and Mathematics on Facebook and Twitter @COSAMAU.